SGAI organised a gala evening of music, song and poetry on 24th March 2007 geared towards widening the r each of the association and in an effort to build bonhomie & bonding amongst members and non-members. Staying true to this objective the event saw a handsome gathering of professional who partook in the evenings offerings with great panache and verve. The audience was mesmerised by the enchanting renditions of yesteryear hindi film hits centered around the theme-'Zindagi' meaning 'Life'. 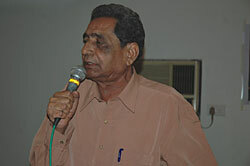 Renowed Shayar Khalil Dhantejvi kept the audience enthralled with his interesting philosophies on the same theme. The evening was also promising for the SGAI because of the support offered to the Screen Printing & Graphics Community by Chief Guest Mr. Suryakant Mahadik pre-eminent Union leader of Bhartiya Kamgar Sena (BKS) one of the leading Labour organisation in india.